Home»Android » OnePlus News Daily Dose #2: Resuming Open Beta, third party developments, OnePlus 7 and more! New week, new Monday motivations – and new set of OnePlus news! Kidding apart, it looks like OnePlus has secretly resumed the Open Beta rollout for OnePlus 6. Yes, that ill-fated Open Beta 12 which was pulled back along with other OB builds for OnePlus 5/5T/6T. Quick recap: in the last week of January, OnePlus started rolling out Open Beta 26 for OnePlus 5 and Open Beta 24 for OnePlus 5T. After a day or two, OB12 for OnePlus 6 and OB4 for OnePlus 6T joined the party. Several users reported about bootlooping or permanent brick after installing the beta – especially on OnePlus 5 and 5T. PiunikaWeb investigated the incident and analysed that the bug was probably originated from faulty incremental OTA zip(s). OnePlus paused the rollout, even for OnePlus 6 and 6T duos. Later on, OnePlus officially acknowledged the issue and advised acutely affected users to visit nearest service centers to get their phones repaired. We also dug the past and found several other incidents by OnePlus distributing botched up OTA updates. Skip to the current day, we can see that OnePlus 6 users are getting the Open Beta 12 build again. No similar report for OnePlus 5/5T has surfaced yet, while OnePlus 6T users are posting about the (re-)arrival of Open Beta 4 at the time of writing this article. We have captured the full OTA update zip and done some analysis. Interestingly the new update is byte-by-byte same as the old one, just the release identifier tag is different. The MD5 hash is 49df640287b3bfe9738817b29df276e3 for both of them which proves that they are identical. Regarding the release identifier tag, it seems to be the part of internal hashing that OnePlus uses to identify the builds. As per our proposition, we think that the incremental OTA zips will be different this time. On the other hand, we were the first to publish that the dev seeding program was revived by OnePlus. Developers started to show their ‘magics’ as soon as they got shiny OnePlus 6T phones for tinkering. We can spot that unofficial LineageOS 16.0 based on Android 9 Pie is already available for OP6T (codename: fajita) by XDA Recognized Developer LuK1337. FYI, official release of LineageOS 16.0 is pretty much imminent. Official crDroid is also here for 6T, courtesy to XDA Recognized Contributor firebird11. eng.stk has pushed first unified Pie kernel for OnePlus 6 family and an updated TWRP. XDA Recognized Developer Myself5 came up with unofficial CarbonROM. While most of the components are working fine under these custom ROMs, the in-display fingerprint scanner is a notable exception. We covered the scenario in details – please take a look if you are interested. For the potential buyers of OnePlus 7, we have something interesting to show as well! Pete Lau, CEO and co-founder of OnePlus, is back to work after celebrating the Chinese New Year. 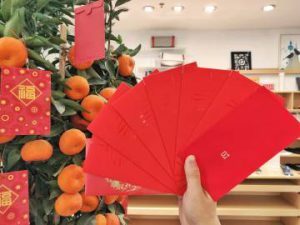 He has wished his co-workers by sharing a picture of red envelopes by Weibo. Guess the number of envelopes – it’s 7! Is it a cryptic hint about the release of OnePlus 7? You tell us. If you guys are looking for some concept arts or renders, Concept Creator got you covered. The concept looks astonishingly premium. OPPO’s R17 Pro, R19 and F11 Pro clearly are the inspirations behind the concept. While the inclusion of the headphone jack is highly unlikely, OnePlus phones traditionally share design elements with OPPO phones. Do you think OnePlus will bring it back with OnePlus 7?